As practical as it is elegant this model is full of delightful features that are sure to please! 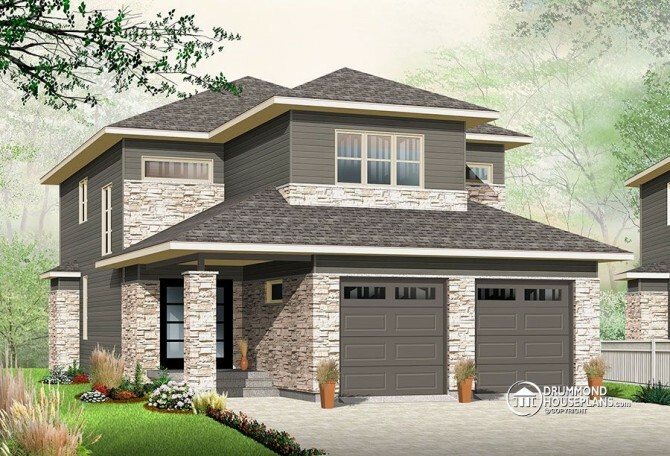 From the well thought out design, that maximizes space in its open floor plan to the entrance foyer that offers not only abundant closet space but has a powder room tucked conveniently to one side an a nursery off the master bedroom, this 2 storey with Contemporary inspiration covers all the bases! Stepping into the main living area, the kitchen area is arranged to maximize space and with a nicely sized island and a beautiful dining area with a view of the back terrace through patio doors just beyond. The living room has a cozy fireplace that can be viewed from the dining area and the kitchen. There is an entrance from the garage through a second foyer that has its own large closet and a mud room area with place to store all of the necessities that a busy family requires. The second floor has a large master suite complete with double vanity and access through the walk-in closet to a home office space that could be used as a spare bedroom because it is also accessible through the laundry room on this level. A walk-in linen closet and two secondary bedrooms that share a full bathroom complete the wonderful features of this unique plan. Haven’t found the perfect house plan yet? Have a look at our full custom design plan gallery, and call us to get your FREE quote for your custom house plan! Wow, this is my dream home!